I’m writing this entry from the plane, about an hour before landing in Chicago. As I write, the happiness of the last few days is punctuated by sadness that they are over. The time I spent with Veri7as, Ar7emis, HP1703, Locke, Fuzzy, Dr Gumaer, Gameshark, Kaidfather, Gravehound, WRTSwoopes, Cowlauncher, Yuzo, OboeCrazy, Roscoe, and all of the other noobtoobers will always stick with me. I’m so amazed by the mechanism by which we have come together. Two people decided to make a podcast; a few people watched and listened. A few more listened, and a site was created. More began to follow and contribute, and we got to know each other online. People from the US, Canada, Israel, the UK, Australia, and all over the world shared a common love for games. In time, we found a common event that could bring us all together: PAX. With that in mind, it’s interesting that I’ve reached the point where I no longer attend PAX to see PAX; I attend to see my friends. PAX was the glue that brought us together, but now that we are bonded, the glue is no longer necessary. I’m not saying that I won’t be attending any more PAX events; I likely will. But I could just as likely go on a weekend retreat or other convention and enjoy it just as much. 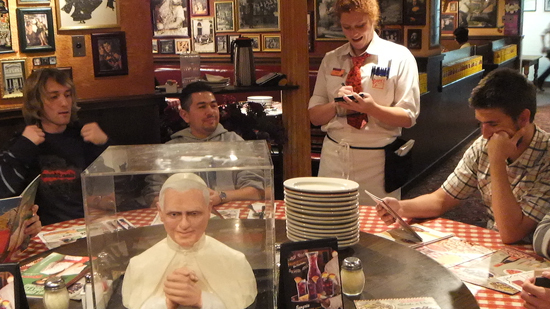 In the picture above, we are sitting at the Pope table at Buca de Beppo’s. Here’s another shot of it. After eating my fill of pasta and chicken saltimbocca, I leaned over to Artie and said “I am so amazingly happy right now.” It’s rare that we get a chance to experience a wonderful moment AND to share that moment with so many good friends.